High visibility clothing must be worn symbol and text safety sign. 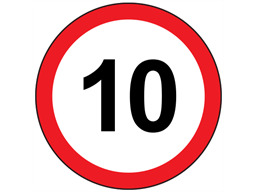 10mph speed limit sign. Part of our traffic control management sign range. Chapter 8 compliant. Class RA1 reflective material. Road traffic signs. 10mph speed limit. Class RA1 reflective surface on 11swg aluminium (3mm thickness). Suitable for public highways. Constructed to BS EN 12899-1: 2007 (replacing BS 873), and Traffic Signs Regulations and General Directions 2002, and as amended 2008 and 2011. Available with or without channel on reverse of sign. RTS011 Size 450mm diameter. Material aluminium. No channel. RTS011C Size 450mm diameter. Material aluminium. With channel. RTS012 Size 600mm diameter. Material aluminium. No channel. RTS012C Size 600mm diameter. Material aluminium. With channel.